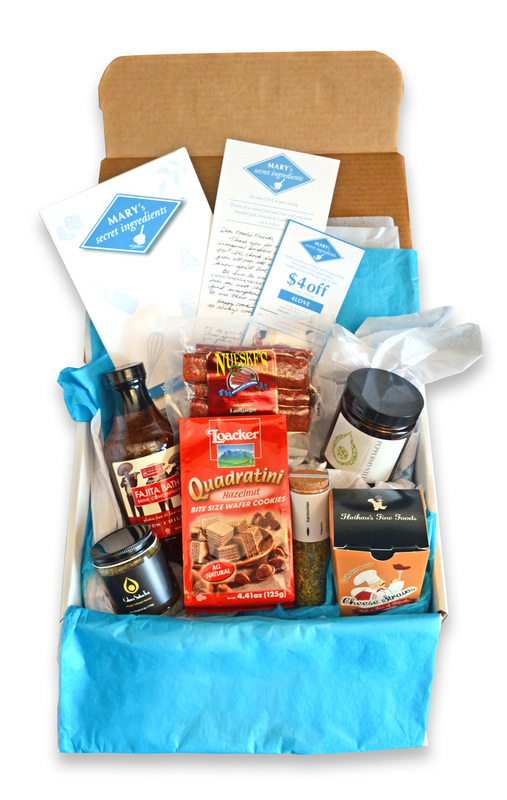 Everyone should have their box of surprise secret ingredients by now. It was chock full of goodies from all over the world. So let me present it to you with music in the video below! This is our lovely Marie Anello, our project manager and soon to be famous opera singer belting it out to the tune of “I Can Cook Too” from On the Town. Created in Austin TX, their brine concentrates produce the most tender and juicy meat, no matter how it’s cooked! Now this is a brine concentrate, NOT a BBQ sauce. You need to follow the directions and dilute this with water to create a quick time brine solution to marinate, tenderize and flavor your chicken, meat or seafood. Either one of the two flavors below were included in our box. Pineapple Habanero Jerk BBQ Bath Brine: This brine is a classic, island inspired recipe with the traditional flavors of pineapple, thyme, allspice, garlic, onion, and of course, habanero chilies. In all, there are 16 herbs and spices and each hits the tongue together with an extra kick from the habaneros. It’s great on pork, poultry, and seafood! Tres Chilies Fajita Bath: This brine uses natural smoked salt and smoked chilies (chipotle, ancho, and cayenne) to bring the taste of the grill indoors. The medium degree of spice of this flavor is balanced with the sweet final note of the apple juice base. Harmonian is a Greek brand just established in June, 2013. The company’s aim is to bring a new understanding of “healthy” and “taste conscious” food to the market. Oregano From Wildcrafted Plants: The ultimate Mediterranean spice – with rich aroma, full flavor and antioxidant properties – is inextricably linked to red sauces, Greek cuisine, and pizza in any form. Following the tradition of Harmonian spice collection, the oregano is collected by hand from wildcrafted plants in Pindos’ cliffs, contributing a unique, strong aroma in contrast to conventionally cultivated oregano. You can smell this through the packaging – it is heavenly! Flathau’s Fine Foods was formed by a husband and wife duo back in 1995. They set out to systematically perfect gourmet snacks, one at a time, and I do believe they succeeded with these cheese straws. And the packaging is so darn cute!! Chipotle Cheese Straws: These are all natural cheese straws made with aged sharp cheddar. Based on the owner’s great grandmother’s family recipe, this version has been released in an updated cheddar chipotle variety, using the right blend of high quality ingredients to create these perfect gourmet snacks. Bite into this traditional Southern favorite blended with a tiny kiss of chipotle that will keep your taste buds coming back for more. “I could eat a LOT of these” my husband, Steve, said. Nueske’s was founded in 1933 by R.C. Nueske who couldn’t find an Applewood smoking flavor as good as his family recipe anywhere. So, he decided to market his smoked bacon, sausage, turkeys and hams in rural Wisconsin. Applewood Smoked Landjaeger Sausages: Super lean cuts of pork and beef are coarsely ground and blended with just the right amount of fresh cracked black pepper to give this slightly chewy, traditional German snack its fabulous Old World flavor. Then they let their smokehouses work their magic, bringing the essence of sweet applewood to each and every bite. A standby for generations of outdoorsmen, these sausages are the perfect tag-along for your next trek through the woods, tailgate event, or any time you crave a deliciously different kind of snack. Calmer Sutra Tea is an Australian family-owned business specializing in crafting deliciously calming tea, herbal tisane and honey blends. They started their tea journey over 10 years ago. Peppermyntle Tea: A calmer twist on a calming drink: Peppermint leaves with a hint of sweet lemon myrtle. This blend is fresh and minty with subtle citrus notes. It’s perfect for refreshing your body, settling an upset stomach, and helping to restore a sense of calm at the end of a long day. Ginger Infused Honey: Smooth textured and sweet, our double blended honey dances with its freshest partner, ginger root, in this palate pleasing blend. It’s sweetness with a calmer KICK! Loacker is an Italian company based in South Tyrol, at the base of the Alps, specifically the Dolomite Mountains, producing wafer and chocolate products. Alfons Loacker founded it in 1926 as a family company. wherever you are: at home, at work, on a trip, or when exercising. Loacker applies craftsmanship to the best raw ingredients to make wafer and chocolate specialties that are appreciated for their fresh, crisp taste, their delicate creams, and their fine chocolate. A delight that never fails to please, combining a love of nature with a passion for the art of baking results in a delicious creation. And they’re not too bad in calories – only about 17 per cube! A big thank you to all of you who ordered a box! Your purchase will help to eradicate childhood hunger as 10% of our annual profits will be donated to Feed The Children. So see you on Wednesday – to put some LOVE in your cooking!